The 2.4 GHz model had an Intel Mobile Core 2 Duo P8600 processor, with 3 MB of L2 cache. The MacBook Pro's second graphics chipset used a portion of main memory as VRAM. Though reported as a 256 MB graphics system, the chipset actually used up to 272 MB of RAM. Announced in October 2008, The MacBook Pro (15-inch, Late 2008) featured a stunning case redesign, the first in the 15-inch MacBook Pro (née PowerBook) line in more than five years. The two-piece "Unibody" case was carved from a single block of aluminum, which made it both extremely strong and impressively thin. The MacBook Pro (15-inch, Late 2008) also featured a striking glass-covered screen, and a new glass-covered, clickable trackpad, which used Apple's Multi-Touch technology, with support for two, three, and four-finger gestures. Under the hood, the MacBook Pro (15-inch, Late 2008) included a number of architectural improvements, though the processor speed remained the same as the previous MacBook Pro. The primary improvement was to the graphics subsystem, which included two fully independent graphics chipsets, the high-performance NVIDIA GeForce 9600M GT and the lower-power GeForce 9400M. In place of the full-size, dual-link DVI port of the previous model was the smaller Mini DisplayPort. The MacBook Pro (15-inch, Late 2008) shipped in two configurations: 2.4 GHz/2 GB RAM/256 MB VRAM/250 GB HD/$1999, 2.53 GHz/4 GB RAM/512 MB VRAM/320 GB HD/$2499. Both models included a backlit-keyboard. Built-to-order options included a 2.8 GHz processor, 250 and 320 GB 7200 RPM hard drives and a 128 GB solid-state drive. The 2.53 GHz configuration was quietly speed-bumped to 2.66 GHz in March 2009. 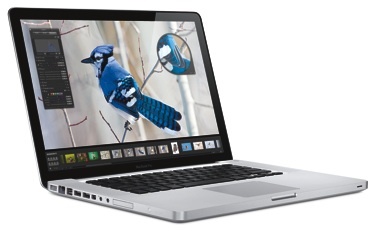 All configurations were replaced in June 2009 by the MacBook Pro (15-inch, Mid 2009).